The latest additions to the Tripawds Gift Shop include these three new designs on t-shirts, sweatshirts, hoodies, other apparel and all sorts of gifts! 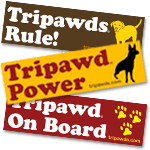 The new Tripawds logo was introduced when the News Blog was updated in early 2015. The three-paw emblem represents a badge of honor for dogs or cats. It also serves as a merit badge for pet parents who learn so much about post amputation care and quality of life in the Tripawds blogs, forums and e-books. Fun silhouette figures represent all the tri-kitties and three legged dogs. Find all these new designs in the Tri Nation section of the gift shop. Single sided designs feature the large tagline and logo. 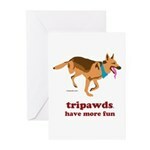 All double sided apparel features the new Tripawds logo on front, with the large tagline on back. Find various bags and other fun gifts and drinkware with these designs in the new Gift Items section too! Support your Tripawds community by wearing your three-legged pride to show the world that…It’s better to hop on three legs than to limp on four! 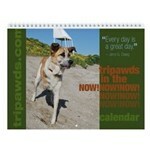 Browse all t-shirt designs here or visit the Tripawds Gift Shop to see all the apparel options and gifts available. I just ordered a “baseball t shirt” with the BADGE! I love the new products with the tagline!!! I need to head over to the gift shop to place an order. I’d be proud to wear this in honor of my Angel Leland!! How about a Tripawd Mom / Tripawd Dad t-shirt? We’ll add that to the growing list of ideas Daniela, thanks! You can browse all Tripawds designs here and anypawdy can create their own personalized Tripawds apparel. 🙂 And then of course, there is plenty of Tripawd Mom jewelry.